37.1. And Jacob settled in the land of his father’s sojourning, in the land of Canaan. 2. These are the descendants of Jacob. Joseph, seventeen years old, was tending the flock with his brothers and he was a lad with the sons of Bilhah and with the sons of Zilpah, his father’s wives. Joseph brought to his father very evil reports about them. 3. Now Israel loved Joseph more than all his children, because he was the son of his old age and he made him a long tunic. 4. And when his brothers saw that their father loved him more than all his brothers, they hated him and could not speak peaceably to him. 37:5. And Joseph dreamed a dream and he told it to his brothers, and they hated him even more. 6. And he said to them, “Listen, now, to this dream which I have dreamed. 7. For, behold, we were binding sheaves in the field and then my sheaf rose and also stood upright. Then, behold, your sheaves stood all around, and paid homage to my sheaf.” 8. And his brothers said to him, “Will you indeed reign over us? Or will you indeed have dominion over us?” And they hated him yet the more for his dreams and for his words. 9. And he dreamed yet another dream and told it to his brothers and said, “Behold, I have dreamed another dream and, behold, the sun and the moon and the eleven stars paid homage to me.” 10. And he told his father and his brothers. His father rebuked him and said to him, “What is this dream that you have dreamed? Will I and your mother and your brothers indeed come to bow down ourselves to you to the earth?” 11. And his brothers envied him, but his father kept the saying in his heart. 37:12. And his brothers went to feed their father’s flock in Shechem. 13. And Israel said to Joseph, “Are not your brothers feeding the flock in Shechem? Come and I shall send you to them.” And he said to him, “Here I am.” 14. And he said to him, “Please, go, see whether it be well with your brothers and well with the flock and bring me word again.” So he sent him out of the vale of Hebron and he came to Shechem. 37:15. And a certain man found him and, behold, he was wandering in the field. And the man asked him saying, “What are you looking for?” 16. And he said, “I am looking for my brothers. Tell me, please, where they are feeding their flocks.” 17. And the man said, “They have gone from here, for I heard them say, ‘Let us go to Dothan.’” And Joseph went after his brothers and found them in Dothan. 18. And when they saw him from afar, and before he came near them they conspired against him to slay him. 19. And they said to one another, “Behold, this dreamer is coming. 20. Come now therefore and let us slay him and cast him into some pit and we will say, ‘Some awful beast has devoured him.’ Then we will see what will become of his dreams.” 21. And Reuben heard it and he delivered him from their hands and said, “Let us not kill him.” 22. And Reuben said to them, “Do not pour out blood! Throw him into this pit that is in the wilderness and do not lay a hand on him,” so he might get him out of their hands, to deliver him to his father again. 23. 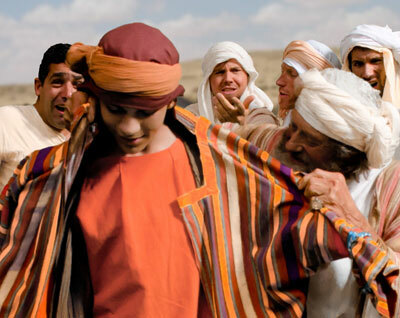 And it was when Joseph had come to his brothers that they stripped Joseph of his tunic, his long tunic that was on him. 24. And they took him and put him in a pit, and the pit was empty, with no water in it. 37:25. And they sat down to eat bread and they lifted up their eyes and looked, and, behold, a company of Ishmaelites had come from Gilead with their camels bearing spices and balm and myrrh, going to carry it down to Egypt. 26. And Judah said to his brothers, “What profit is it if we slay our brother and conceal his blood? 27. Come, let us sell him to the Ishmaelites, and let not our hand be upon him, for he is our brother, our flesh.” And his brothers heeded him. 28. Then the Midianites, merchantmen, passed by and they drew and lifted up Joseph out of the pit, and sold Joseph to the Ishmaelites for twenty pieces of silver, and they brought Joseph into Egypt. 37:29. And Reuben returned to the pit and, behold, Joseph was not in the pit and he tore his clothes. 30. And he returned to his brothers and said, “The boy is not there! And I – where will I go?” 31. And they took Joseph’s tunic, and killed a kid of the goats, and dipped the tunic in the blood. 32. And they sent the long tunic and they brought it to their father and said, “We have found this. Now do you know whether or not it is your son’s tunic?” 33. And he knew it and said, “It is my son’s tunic. An awful beast has devoured him. Joseph is without doubt torn in pieces.” 34. And Jacob tore his clothes and put sackcloth upon his loins, and mourned for his son many days. 35. And all his sons and all his daughters rose up to comfort him, but he refused to be comforted and he said, “For I shall go down into the grave mourning for my son.” Thus his father wept for him. 37:36. And the Midianites sold him in Egypt to Potiphar, an officer of Pharaoh’s, captain of the guard. Then Tamar went and lived in her father’s house. 12. And in process of time the daughter of Shua, Judah’s wife died and Judah was comforted, and went up to his sheep-shearers to Timnah, he and his friend Hirah the Adullamite. 13. And Tamar was told, saying, “Look, your father-in-law is going up to Timnah to shear his sheep.” 14. And she put her widow’s garments off from her, covered herself with a veil and wrapped herself and sat in an open place, which is on the road to Timnah, for she saw that Shelah had grown and she was not given to him for a wife. 15. When Judah saw her, he thought her to be a harlot because she had covered her face.16. And he turned to her along the way and said, “Come on now, let me come in to you.” For he did not know that she was his daughter-in-law. And she said, “What will you give me, that you may come in to me?” 17. And he said, “I shall send a lamb from the flock.” And she said, “Will you give me a pledge, until you send it?” 18. And he said, “What pledge will I give you?” And she said, “Your signet, your cord, and your staff that is in your hand.” And he gave them to her and came in to her, and she conceived by him. 38:24. And it was about three months later that it was told Judah saying, “Tamar your daughter-in-law has played the harlot and also, behold, she is with child by harlotry.” And Judah said, “Bring her forth and let her be burned.” 25. When she was brought forth, she went to her father-in-law saying, “By the man whose these are, I am with child.” And she said, “Discern, now, whose these are; the signet, cord, and staff.” 26. And Judah acknowledged them and said, “She has been more righteous than I because I did not give her to my son Shelah.” And he did not go in to know her again. 27. And it happened at the time of her travail that there were twins in her womb. 28. And it was, when she travailed, that the one put out his hand and the midwife took and bound upon his hand a scarlet thread saying, “This one came out first.” 29. And it happened as he drew back his hand that, behold, his brother came out and she said, “How vigorously you have broken forth!” Therefore his name was called Perez (Perets). 30. And afterward his brother came out, who had the scarlet thread on his hand and his name was called Zerah. 39.1. And Joseph was brought down to Egypt and Potiphar, an officer of Pharaoh, captain of the guard, an Egyptian, bought him from the hands of the Ishmaelites, who had brought him down there. 2. And the LORD* was with Joseph and he was a successful man and he was in the house of his master the Egyptian. 3. And his master saw that the LORD* was with him, and that the LORD* made all that he did to succeed in his hand. 4. And Joseph found favor in his sight, and he served him and he made him an overseer over his house, and he put everything he had into his hand. 5. And it was from the time that he had made him overseer in his house and over all that he had, that the LORD* blessed the Egyptian’s house for Joseph’s sake, and the blessing of the LORD* was upon all that he had in the house and in the field. 6. And he left all that he had in Joseph’s hand and he did not know anything he had, except the bread which he ate. And Joseph was good looking and well favored. 39:7. And it happened after these things that his master’s wife cast her eyes upon Joseph and she said, “Lie with me.” 8. But he refused and said to his master’s wife, “Look, my master does not know what is with me in the house and he has committed all that he has to my hand. 9. There is no one greater in this house than I; neither has he kept back anything from me but you, because you are his wife. How then can I do this great wickedness and sin against God?” 10. And it was, as she spoke to Joseph day by day, that he did not pay heed to her, to lie with her, to be with her. 39:11. And there was a day that Joseph went into the house for his work and none of the men of the house was inside. 12. And she caught him by his garment saying, “Lie with me.” And he left his garment in her hand and fled and got himself out. 13. And it happened, when she saw that he had left his garment in her hand and was gone, 14. she called to the men of her house and spoke to them saying, “See, he has brought in a Hebrew to us to mock us. He came in to me to lie with me and I cried with a loud voice. 15. And it was, when he heard that I lifted up my voice and cried that he left his garment with me and fled, and got himself out.” 16. And she put his garment by her until his master came home. 17. And she spoke to him according to these words, saying, “The Hebrew servant whom you have brought to us came in to me to mock me. 18. And it was, as I lifted up my voice and cried that he left his garment with me and fled outside.” 19. And it happened, when his master heard the words of his wife, which he spoke to him saying, “Your servant did after this manner to me” that his wrath was kindled. 20. Joseph’s master took him and put him in the prison, a place where the king’s prisoners were bound, and he was there in the prison. 39:21. But the LORD* was with Joseph and showed him loving kindness, and gave him favor in the sight of the keeper of the prison. 22. And the keeper of the prison committed to Joseph’s hand all the prisoners in the prison, and whatever they did there, he accomplished. 23. The keeper of the prison did not look after anything that was under his hand, because the LORD* was with him, and the LORD* made everything he did succeed. 40.1. And it was after these things that the cupbearer of the king of Egypt and the baker sinned against their master, the king of Egypt. 2. And Pharaoh was very angry with two of his officers, the chief of the cupbearers and the chief of the bakers. 3. And he put them in custody in the house of the captain of the guard in the prison, the place where Joseph was bound. 4. And the captain of the guard put Joseph over them and he ministered to them, and they continued a season in custody. 40:5. And each of them dreamed a dream, each man his dream in one night, each man according to the interpretation of his dream, the cupbearer and the baker of the king of Egypt who were bound in the prison. 6. And Joseph came in to them in the morning and looked upon them and, behold, they were sad. 40:16. When the chief baker saw that the interpretation was good, he said to Joseph, “I too was in my dream and, behold, I had three baskets of white bread on my head. 17. And in the uppermost basket there was all manner of Pharaoh’s food and the birds ate them out of the basket on my head.” 18. And Joseph answered and said, “This is its interpretation. The three baskets are three days. 19. Yet within three days Pharaoh will lift up your head from off you and will hang you on a tree, and the birds will eat your flesh from off you.” 20. And that happened on the third day, which was Pharaoh’s birthday, that he made a feast for all his servants and he lifted up the head of the chief cupbearer and of the chief baker among his servants. 21. And he restored the chief cupbearer to be his cupbearer again, and he gave the cup into Pharaoh’s hand. 22. But he hanged the chief baker as Joseph had interpreted to them. 23. Yet the chief cupbearer did not remember Joseph, but forgot him. I’m struggling to find what is distinctive in this translation. Could you explain that some more? Thank you for asking. There are several distinctions in the One New Man Bible: some words are translated by tradition, not accurately. In the New Testament the Greek word Naos is usually translated Temple, it means Sanctuary. Read Sanctuary in Glossary. The Hebrew Anokhi is usually not translated, but it is a very significant word. Read Anokhi of Glossary. The Hebrew word Ts’dakah is usually translated Righteousness, but it means Acts of Loving Kindness. Read Hesed in Glossary. Other translations say Moses said to Pharaoh “Let my people go” but he actually said “Send my people away!” There are well over 4,300 footnotes and the Glossary is over 140 pages. Read through this Bible then you will not need to ask about what id distinctive. I absolutely enjoy my ” One New Man Bible” as a whole! My bible study has been refreshed and less complex as I continue my journey to understand the mindset of Biblical Hebrew. Dr. Bill, I have a question…. Can you explain the first mention principle in studying scripture? and what is the mindset posture as one begin to study the proper context? Or … how is this truth applied? Thank you for writing. It is wonderful to read of someone enjoying the Bible, my life’s work. It is not clear to me what you mean by ‘first mention principle’ but the mindset posture is easier. It is necessary to maintain an open mind when reading and discussing, so you are able to process new ways of thinking and expressing thoughts. In the Bible we have many mindsets from tradition, like David being a teenager when he fought Goliath, but he was actually 27 or 28 at that time. Mindsets much more often are theologically based, less clearly recognized than that with David and Goliath, but an open mind is essential. We must be like the Bereans, searching the Scriptures daily seeking Truth and weighing numerous passages, not just one or two for confirmation. Sorry about that. The price is $39.95 and the publisher will be in contact with you. Have been enjoying your One New Man Bible. Had never suspected that Joseph brought back evil reports of his brothers and then twice stuck his foot in his mouth relating his dreams. The Lord works in misterious ways. I do believe where you print that so and so came in to a woman that it might be more accurate to render it(into) as that is what occurred in actuality. I realize that it could be interpreted as coming into a dwelling, but that wouldn’t produce a child necessarily as that is what happened ultimately. But that is a small item. Love your work in this version. Thank you for your comments. I used in to as two words because it is saying he went inside to a woman, rather than into a woman.